This entry was posted in Personal and tagged embarrasing, embarrassed, fart, funny, gas, humiliated, irritable bowel syndrome, odor, smell by aholydiscontent. Bookmark the permalink. Oh my I was laughing so hard that I had tears in my eyes and awoke Cayley. 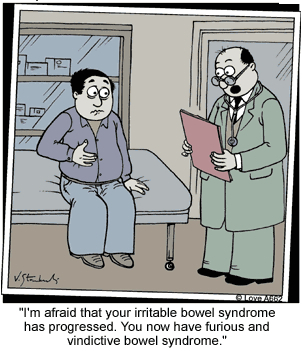 Sorry about IBS but it made for a great story. Oh my Lord Aaron! You are hil-arious! I just called D into the office to read this as tears were streaming down my face from laughing so hard! *It’s true, everyone has a fart AND OR poop story! The other guy in the loo (bathroom for you Americans!) if he had any sense would not have been breathing through his nose. So you could still be in the clear. Your shameful secret may still be safe with…the thousands you’ve now shared it with! BTW, have you tried charcoal? 1) when you have office mates that are friends of friends on facebook, you should be careful what you post. 3)i won’t share this, but it’s tempting. shoulda said three things i suppose?! see you round the water closet..
Dude, hilarious. Very well written too. So the guy in the bathroom, as far as you know, didn’t say anything to anyone? I’m so happy right now that so many of you enjoyed this. Lots of laughter tears a flowin’! Yes! The funniest part is that the story is completely TRUE! Every detail! Dude, the longer this story went, the more I was certain that someone hacked your blog. Maybe Morgan, getting revenge for throwing back the covers every morning to let the “Smoke Monster” out. The “John” was misspelled as “jon” in your witty post. Please correct so all the jons of the world are not guilty by association.